This season I was lucky to work with hair stylist and makeup artist Hedy Lavinsky to style my Fall 2014 Collection lookbook. In my previous backstage beauty post, I mentioned that Hedy created a fresh and minimal look focusing on soft and luminous skin. A natural lip with minimal color to complimented the soft curling eyelashes illustrating a fresh youthful look. Hair was set to look polished and feminine with a middle part and teased low ponytail. A navy velvet headband accented the hair style to complement the palette of moody blues throughout the collection. As we set out on location to shoot the “Still Cold” film for my Fall 2014 collection – trying to keep the fresh and polished look Hedy had created was a difficult task due to “Fogust” here in San Francisco. 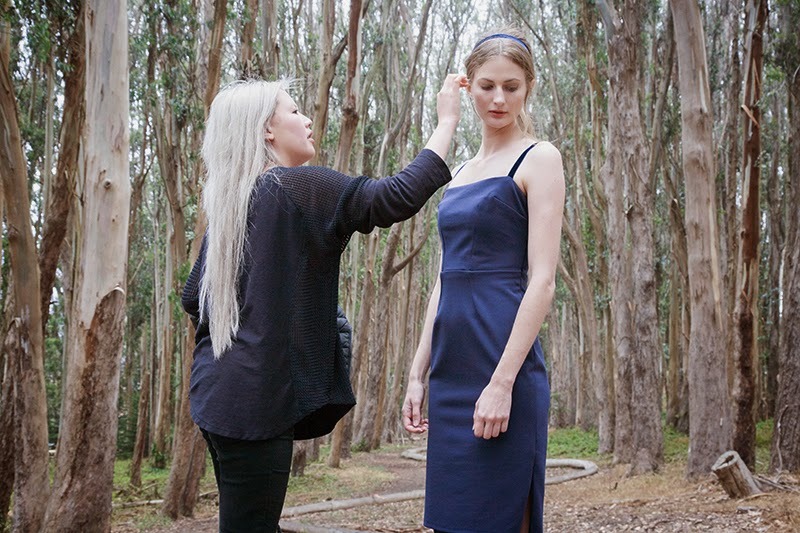 As usual – we set out to shoot early in the morning however the San Francisco wind and fog made it difficult to keep our models hairstyles polished to perfection. Thankfully our stylist Emme was able to manage beauty styling as I focused on the collection backstage during our short film. In the end the soft wispy hair styling was just touch we needed to the “Still Cold” fashion film – and as it was quite cold on set – backstage beauty worked out perfectly with the theme for our lookbook.